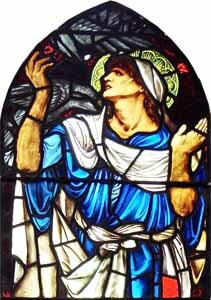 Edward Burne-Jones, 'Elijah the Prophet' (1897), stained glass, St. Martin's Church, Bramton, Cumbria, England. God can get anyone's attention by shouting. For example, on the road to Damascus, a loud voice and a bright light turned his arch enemy into a disciple. But most of the time, he prefers to speak in a softer voice, one that we can miss if we're not listening carefully. I'm not sure anyone can be a real expert on hearing God's voice, since God controls it, not we. And I've had some embarrassing gaps in both listening and obeying -- some of which I'll relate to you. Recently, however, God has put on my heart to share with you what I have learned over 50 years of actively listening for God's voice. I've found that when I seek God for what to preach and teach, I am usually able to discern his desire. I sought the Lord about the girl to marry -- and even received the date of the marriage from God. God's voice has been a huge comfort and guide for me over my lifetime. I share humbly, however, realizing that I have much to learn. The focus of this study is hearing God's voice in words and in promptings. When I say "hear," I don't mean to suggest that God usually speaks in an audible voice, but that we can discern him speaking in strong impressions in our mind and spirit. It is that form of the voice of God that is what we're especially exploring in this study. Three things aren't our focus -- the spiritual gifts of prophecy, the word of knowledge, and the word of wisdom. Of course, the Holy Spirit is the common denominator between these gifts and how the normal disciple might hear God's voice and promptings. But to treat these gifts of the Spirit adequately would require a completely different kind of study -- and is beyond my experience. Nor is this a comprehensive study of God's guidance -- a subject all its own. God guides us in many ways -- through circumstances, other people, a Bible verse that the Holy Spirit "quickens" to us. And, of course, God's voice can be a means of guidance. Here, we are narrowly focusing on God's voice and promptings, to try to understand them better. The challenge is that I am seeking to teach a learned skill or art, not a body of content. This isn't a set of objective rules you can follow to get the desired result. It is subjective. Relational. Controlled by God, not us. Nor can I sit down with you at Starbucks to give you feedback and help you as you learn. I know that God is fully able to speak to his people directly without any assistance. However, I believe you'll learn faster and better if you learn to listen to God as part of a Christian community. So I'll be asking you to find a mentor (if you are able), plus a spiritual partner with whom you can interact as you begin to learn what God's voice and whisperings sound like. Don't try this all by yourself -- you just won't get nearly as much out of it! I'll also be asking you secure a small journal and begin a daily Quiet Time -- or renew your current practice so it is more meaningful. You'll be completing a practical assignment in each lesson -- and then you'll share how it's working out with your spiritual partner. In this way you can try your wings, and begin to learn to fly even before you finish the study. However, I must warn you that you face a clear spiritual danger as you begin this course. If you settle for learning about God's voice without seeking to know, discern, and obey him yourself, you will suffer great damage, for this will have the effect of "inoculating" you against catching a full-blown case of conversing with the living God. "Be doers of the word, and not hearers only, deceiving yourselves" (James 1:22). So plan to enter fully into the process; don't just read and nod your head. I've found that this idea of hearing God's voice is amazingly attractive to us humans. I used to take my guitar and sing at convalescent homes. By far the most often requested song among the folks of a certain generation was, "In the Garden." The Son of God discloses. None other has ever known." I invite you to join me on a journey of drawing closer to Jesus, to listening for and then obeying God's voice and promptings. Words and music: C. Austin Miles (1912).